Published on April 7, 2013 in Bands/Artists, Daytrotter, Eastern Iowa, Music, Out and About and Upcoming Show. 0 Comments Tags: Barnstormer, Chasing Shade, Codfish Hollow, Codfish Hollow Barn, Counting Crows, Dan Bern, Daniel and the Lion, Daytrotter, Field Report, IA, Maquoketa, May 4th, Outlaw Roadshow, Pomegranates, Twin Tigers. The winter had overstayed its welcome in Eastern Iowa this year and with the frost finally succeeding and the bulbs pushing their greens up in anticipation of flowering, we can finally (hopefully) start looking forward to Spring and Summer and to the recent announcement by Codfish Hollow of the first show in the barn this year! Last year we saw two really amazing events in the Codfish Hollow Barn stage even without an official Daytrotter Barnstormer show. July 4th brought a mind-melting and body-dehydrating appearance by Counting Crows and their touring Outlaw Roadshow lineup for what would certainly be for the 650 people who saw it the best show they’ve ever seen. The laid-back and mellow atmosphere seemed to coax a normally grouchy Duritz to hang out with people outside the venue and pose for pictures and pause for autographs. The show inside the barn was electric and even with the failure of the stage electric fans the bands sweated their way through their sets and Counting Crows put forth an unprecedented 3 hours on stage! Codfish Hollow then put all their political chips on support of the Democratic Party with a chilly October show featuring a lineup headlined by Pieta Brown and Dave Zollo and the Body Electric. On May 4th (May the Fourth Be With You!) 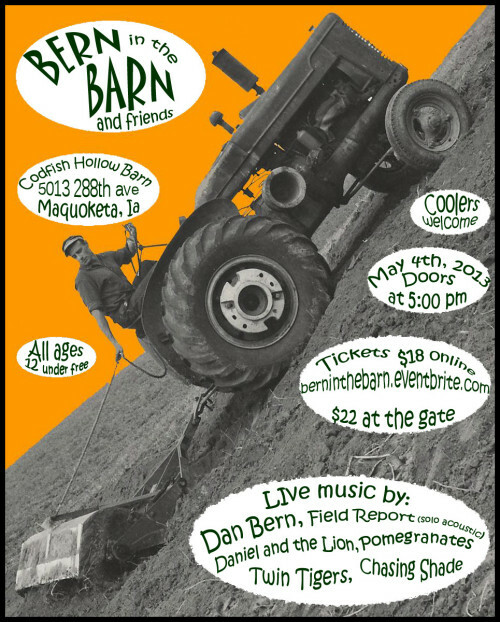 Codfish Hollow returns with a show featuring Dan Bern! Called amusingly enough, “Bern in the Barn” the lineup also features Outlaw Roadshow veteran Field Report as a solo performance by Christopher Porterfield, 2013 Outlaw Roadshow act Daniel and the Lion, Cincinnati band Pomegranates, Athens, GA band Twin Tigers who have a sound somewhere between Lou Reed and Sonic Youth and maybe Barnstormer alums Suckers, and Iowa City guitar popsters Chasing Shade. 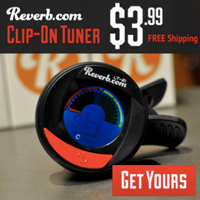 You should check out Chasing Shade’s song “Sunburned Bones,” BTW. So, click on all those links above to find out what these bands are about– but it’s looking like a wonderful evening of music for a very resonable $18 in advance. There will be the regular lineup of food vendors onsite, and the scattering of fire rings to keep warm– this barn is down in a hollow for gosh’s sakes, and the sun quickly ascends the road out of there in the evening, and 10 degree temp drops are not uncommon– so pack a sweater, kids! These shows at Codfish Hollow are always wonderful and are special shows for bands and fans alike and are really a must-see for anyone who can make it. Much love, respect and gratitude is due Tiff and Shawn Biehl for continually bringing the magic to their barn. The food vendors will be providing Grilled chicken sandwiches, BBQ pulled pork sandwiches, Hot dogs, Veggie dogs, Nachos and cheese, Chicken/pork nachos, Vegetarian Bean Nachos, Chips, Giant Dill pickles, Candy bars, POP- Mt.Dew Pepsi, Diet Pepsi,Sprite, Bottled water, Coolers are welcome. That means bring your own booze if you want it! For more information, you can follow the Codfish Hollow Facebook page, and the Facebook event invitation. To order tickets for Bern in the Barn, you can go to the Eventbrite ticket ordering page— tickets are $18 in advance and $22 at the day of the show. The Time to play b-sides archives for the twin-tigers tag.